Lying at the northern end of the Bay of Naples, the mountainous volcanic island of Ischia draws many travellers with its thermal spas and the beneficial properties of the hot springs and rich volcanic mud. There are also some beautiful gardens laid out with tropical and Mediterranean plants that are open to visitors. Arguably one of the most famous stretches of coastline in Europe, the stunning Amalfi coastline stretches south from the peninsula of Sorrento. Colourful quaint villages cling to vertiginous cliffs as the coastline winds its rocky way, puncturing the clear azure sea. Best of all, by far and away the most beautiful views are gained by sea; from the deck of a charter yacht you can relax well away from the tourist traffic and watch the pastel colours of the buildings blaze in the setting sun, then twinkle into life at night. 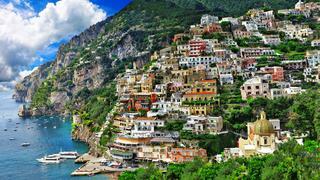 One of the most popular destinations is the town of Positano. For decades artists, rock stars, actors and writers have flocked here. It is worth the climb up the narrow streets to visit one of the small boutiques offering “Positano Fashion” and have some clothes or sandals made to order. The town of Amalfi itself lies at the mouth of a deep gorge and is surrounded by towering cliffs and breathtaking scenery. Climb up the steps to visit the striking Duomo di Amalfi (St Andrew’s Cathedral) which dates back to the 11th century… and there are numerous other wonderful building including the elegant arches of the aptly-named 13th Century Chiostro del Paradiso (the Cloister of Paradise). 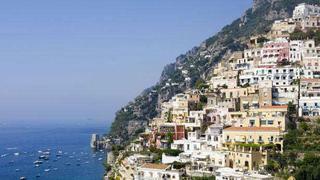 Just the name Capri evokes images of a stunning island populated by beautiful people enjoying La Dolce Vita. This island has been a tourist destination since pre-Roman times and no wonder: with delights such as the Blue Grotto, the palace of the Emperor Augustus and stunning scenery it’s easy to see why people are still drawn to this island. Because the island has long been popular with the elite, the shopping and dining is of a very high quality; after hitting the shops, seek out one of the world-class restaurants perched high above the sea and drink in the wonderful views. Anchor off Positano, land on the private beach of the 5-star hotel San Pietro di Positano and take the lift up to the hotel that is perched high on the cliff above. A sunset cocktail on the terrace surrounded by truly stunning panoramic views is one of the world’s great pleasures. Capri, Blue Grotto: The iridescent sapphire blue light in the blue grotto must be seen to be believed. Ischia: Tuck in behind the little island of Ischia Ponte for a great anchorage well away from the ferries.